This is our first look at the all-new, second-generation Mercedes-Benz CLA, which is due to be launched this year. 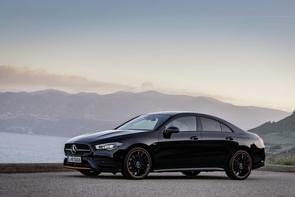 It sits above the new A-Class Saloon in the expanding Mercedes line-up. Visually, the CLA is the same as the new, fourth-generation A-Class from the front to about the windscreen, and then it follows its own design path. Albeit, you might notice that the CLA has two longitudinal strakes on its bonnet, which the company calls 'powerdomes' - these aren't on the A-Class hatch. Around the sides are frameless doors, while the back is heavily reminiscent of its larger CLS sibling, with slim light clusters and a number plate dropped into a bumper recess. Inside, it's the same magnificent cabin as the A-Class, which means - in its top, optioned-up specification - it's the MBUX infotainment system that can be displayed on a pair of gorgeous 10.25-inch digital displays, and to which a form of gesture control has been added for the CLA. And, because the CLA is 48mm longer, 53mm wider and has a 30mm longer wheelbase than its predecessor, with broader front and rear tracks too, Mercedes is claiming increased head-, shoulder- and elbow-room for both rows of occupants, which is nice - albeit, boot space is down 10 litres from the old CLA to stand at 460 litres overall on the new one. Mercedes makes mention again of the 63mm/55mm (front/rear) broader track widths on the car, plus its lower centre-of-gravity, to talk about the CLA having the 'sportiest driving characteristics of all models in the new generation of compacts' from the company. It also has an impressive coefficient of drag figure of 0.23. There's a decoupled multilink axle at the back, a Direct Steer system as standard and active adaptive damping will be on the options list. Wheel sizes are listed as anything between 16 and 19 inches in diameter. Just one engine has been confirmed so far, which is the 2.0-litre, turbocharged four-cylinder petrol unit as seen in the A 250, where it is rated at 225hp and 350Nm. This unit, in the CLA 250, is mated to a 7G-DCT dual-clutch automatic transmission, with fuel economy and CO2 emissions yet to be ratified. Mercedes says a 'broad range' of petrol and diesel options will follow the CLA 250, as will 4Matic all-wheel drive.